His feast day is May 16. Like the wanderings of Ulysses, the story of Saint Brendan voyaging over perilous waters was a popular story in the Middle Ages. We see him as only a shadow in the old Celtic world, and who he was or where he came from is uncertain, though it is supposed that he was born the son of Findlugh on Fenit Peninsula in Kerry, Ireland, of an ancient and noble line. It is said that he studied theology under Saint Ita at Killeedy, that he was a contemporary and disciple of Saint Finian and later Saint Gildas at Llancarfan in Wales, and that later he founded a monastery at Saint Malo. Another version of his early life says that the infant Saint Brendan was given into the care of Saint Ita, who taught him three things that God really loves: "the true faith of a pure heart; the simple religious life; and bountifulness inspired by Christian charity." She would have added the three things God hates are "a scowling face; obstinate wrong-doing; and too much confidence in money." When he was six he was sent to Saint Jarlath's monastery school at Tuam for his education, and was ordained by Bishop Saint Erc in 512. Though Brendan was a real person, fabulous stories are told how his wanderings in search of an unknown land, perhaps the Faroes, the Canaries, or the Azores. For seven years he voyaged to find the Promised Land of the saints. On the Kerry coast, with 14 chosen monks, he built a coracle of wattle, covered it with hides tanned in oak bark softened with butter, and set up a mast and a sail, and after a prayer upon the shore, he embarked in the name of the Trinity. After strange wanderings he returned to Ireland and, about 559, founded a great monastery at Clonfert in Galway of 3,000 monks and a convent under his sister Briga. He gave his monks a rule of remarkable austerity. Later he visited the holy island of Iona, which was the center of much missionary activity. He founded numerous other monasteries in Ireland and several sees. And he himself made missionary journeys into England and Scotland. It is said that Columbus, to whom Brendan's story would have been familiar, may have been inspired by the saint's epic saga Navigatio Sancti Brendani Abbatis. Long before Columbus, the Irish monks were renowned as travelers and explorers. Tradition says that they reached Iceland and explored even farther afield in the Atlantic--perhaps as far as America. Scholars long doubted the voyage to the Promised Land described by Brendan could have been to North America, but some modern scholars now believe that he may have done just that. In 1976-77, Tim Severin, an expert on exploration, following the instructions in the Navigatio built a hide-covered curragh and then sailed it from Ireland to Newfoundland via Iceland and Greenland, demonstrating the accuracy of its directions and descriptions of the places Brendan mentioned in his epic. Brendan himself stands out in a dark age as the captain of a Christian crew. Like the Greeks and the Vikings, he had a craving for the sea, but he built his boat, and launched it in the name of the Lord and sailed it under the ensign of the Cross. It is a thrilling saga, for all its strangeness, and set many a sailor later to search in vain for Saint Brendan's Island; but none ever found it, though it was said at times to be seen, like an Isle of Paradise, riding above the surface of the sea. Now the great mountain that juts out into the Atlantic in County Kerry is called Mount Brandon, because he had a little chapel atop it, and the bay at the foot of the mountain is Brandon Bay. Brendan probably died while visiting his sister Briga, abbess of a convent at Enach Duin. There is a graphic description of one of their expeditions: "Three Scots came to King Alfred, in a boat without oars, from Ireland, whence they had stolen away, because for the love of God they desired to be on pilgrimage, they wrecked not whither. The boat in which they came was made of two hides and a half; and they took with them provisions for seven days; and about the seventh day they came on shore in Cornwall, and soon after went to King Alfred." Saint Brendan was chanting the office for the Feast of Saint Paul the Apostle, when his brethren asked him to do so quietly for fear of disturbing the sea monsters. He laughed, "What has driven out your faith? Fear naught but the Lord our God, and love Him in fear. Many perils have tried you, but the Lord brought you safely out of them all. There is no danger here. What are you afraid of?" And he celebrated Mass more solemnly than before. "Thereupon the monsters of the deep began to rise on all sides, and making merry for joy of the Feast, followed after the ship. Yet when the office of the day was ended, they straightway turned back and went their way". They sailed to another small, lovely island, in which there was a whirlpool. "They went across the island, and found a church built of stone, and in it a venerable old man at his prayers... And the old man said to them, 'O holy men of God, make haste to flee from this island. For there is a sea-cat here, of old time, inveterate in wiles, that hath grown huge through eating excessively of fish.' Thereupon they turned back in haste to their ship, and abandoned the island. "But lo, behind them they saw that beast swimming through the sea, and it had great eyes like vessels of glass. Thereupon they all fell to prayer, and Brendan said, 'Lord Jesus Christ, hinder Thy beast.' And straightway arose another beast from the depths of the sea, and approaching fell to battle with the first; and both went down to the depth of the sea, nor were they further seen. Then they gave thanks to God, and turned back to the old man, to question him as to his way of living and whence he had come. "And then he showed them the way to the land which they sought; and receiving the Host at the hands of Brendan, he fell joyfully asleep in the Lord; and he was buried beside his companions." "Now there was above the spring a tree of strange height, covered with birds of dazzling white, so crowded on the tree that scarcely could it be seen by human eyes. And looking upon it the man of God began to ponder within himself what cause had brought so great a multitude of birds together on one tree." He prayed with tears that God might reveal the mystery of the birds to him. "And the bird spoke to him. 'We are,' it said, 'of that great ruin of the ancient foe, who did not consent to him wholly. Yet because we consented in part to his sin, our ruin also befell. For God is just, and keeps truth and mercy. And so by His judgment He sent us to this place, where we know no other pain than that we cannot see the presence of God, and so hath He estranged us from the fellowship of those who stood firm. On the solemn feasts and on the Sabbaths we take such bodies as you see, and abide here, praising our Maker. And as other spirits who are sent through the divers regions of the air and the earth, so may we speed also." 'Now hast thou with thy brethren been one year upon thy journey; and six years yet remain. Where this day thou dost keep the Easter Feast, there shalt thou keep it throughout every year of thy pilgrimage, and thereafter shalt thou find the thing that thou hast set in thy heart, the land that was promised to the saints.' And when the bird had spoken thus, it raised itself up from the prow, and took its flight to the rest. "And when the hour of evening drew on, then began all the birds that were on the tree to sing as with one voice, beating their wings and saying, 'Praise waiteth for Thee, O Lord, in Sion: and unto Thee shall the vow be performed.' And they continued repeating that verse, for the space of one hour. "It seemed to the brethren that the melody and the sound of the wings was like a lament that is sweetly sung. Then said Saint Brendan to the brethren, 'Do ye refresh your bodies, for this day have your souls been filled with the heavenly bread.' And when the Feast was ended, the brethren began to sing the office; and thereafter they rested in quiet until the third watch of the night. "Then the man of God awaking, began to rouse the brethren for the Vigils of the Holy Night. And when he had begun the verse, 'Lord, open Thou my lips, and my heart shall show forth Thy praise,' all the birds rang out with voice and wing, singing, 'Praise the Lord, all ye His angels; praise ye Him, all His hosts.' And even as at Vespers, they sang for the space of one hour. "Then, when dawn brought the ending of the night, they all began to sing, 'And let the beauty of the Lord our God be upon us,' with equal melody and length of chanting, as had been at Matins. "Here then the brethren remained until the Whitsun Feast; for the sweet singing of the birds was their delight and their reviving... But when the octave of the feast was ended, the Saint bade his brethren to make ready the ship, and fill their vessels with water from the spring. And when all was made ready, came the aforesaid bird in swift flight, and rested on the prow of the ship, and said, as if to comfort them against the perils of the sea: 'Know that where ye held the Lord's Supper, in the year that is past, there in like fashion shall ye be on that same night this year... After eight months ye shall find an island... whereon ye shall celebrate the Lord's Nativity.' And when the bird had foretold these things, it returned to its own place. "Then the brethren began to spread their sails and go out to sea. And the birds were singing as with one voice, saying, 'Hear us, O God of our salvation, Who art the confidence of all the ends of the earth, and of them that are afar off upon the sea.' And so for three months they were borne on the breadth of ocean, and saw nothing beyond the sea and sky." 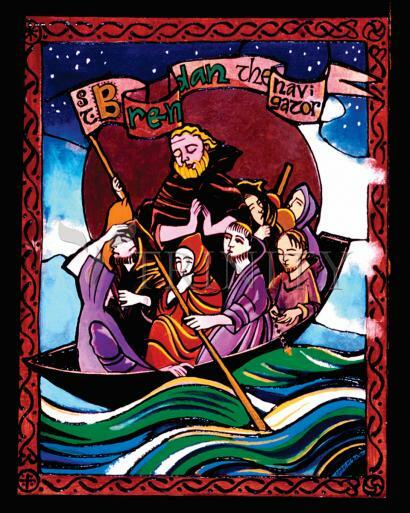 In art, Saint Brendan is often shown saying Mass on ship as the fish crowd round to listen to him. He may also be shown holding a candle. Just inside the main doors of Saint Patrick's, across from Saint Brigid, stands a statue of Saint Brendan holding his ship. Brendan is the patron of seafarers and travelers, and is venerated in Ireland. "I fear that I shall journey alone, that the way will be dark; I fear the unknown land, the presence of my King and the sentence of my judge." —The dying words of Saint Brendan to his sister Abbess Brig.